If you’re wondering how to grow succulents indoors, basically you need to outfit a basement, sun room, spare room or alcove with tables and shelves that can withstand moisture, plus lights and a fan that run on timers. Fortunately succulents need very little water. Dribble a little at the base of each plant every three weeks or so, enough to hydrate the roots but not so much it puddles on the floor. Don’t fertilize succulents when they’re dormant (growth slows to a standstill, usually in winter). 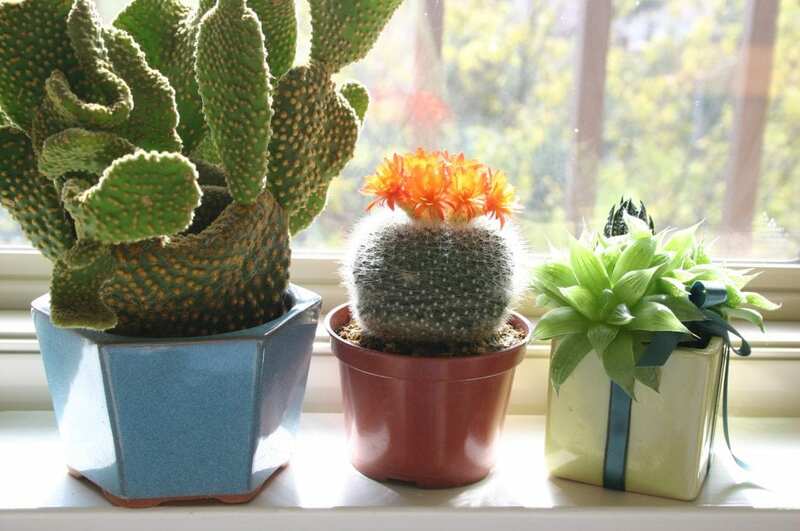 Move potted succulents indoors when temperatures drop into the 30s. Clean the pots’ exteriors and check for pests. Keep them above 32 degrees F but not higher than 60 (cold is necessary for flowering later on). Keep a fan running to enhance air circulation, and a dehumidifier if the air is moist. Place your succulents near a window. Maximum sun exposure is on the south and west sides of your house. The farther north you live in North America, east will provide bright light, but not enough for crassulas, echeverias and aloes to maintain their red hues. Don’t set plants near heaters or furnace vents. They’ll cause the soil to dry out and your plants to desiccate. Install grow lights. Situate indoor succulents beneath lights that stay on six hours daily. Fluorescent is fine and economical. Experts in growing succulents in gray-sky climates recommend T-5 grow lights. If your plants stretch toward light (or flatten their rosettes to expose more of their surface area), add more lights or move the plants closer to the ones you have. Agrobrite FLT44 T5 Fluorescent Grow Light System, 4 Feet, 4 Tubes, about $120 on Amazon. No room? Go vertical. Create a “light island.” There are shelving units designed for indoor plants. Each shelf has a waterproof tray, and each unit is lit by two T5 bulbs. The lights, on timers, stay on from 7 am to 7 pm daily. Shown below is arguably the ultimate indoor plant-shelf unit. Made of lightweight, powder-coated aluminum, it has adjustable lights with energy-efficient, full-spectrum bulbs; plastic drip trays; and wheels for easy positioning. 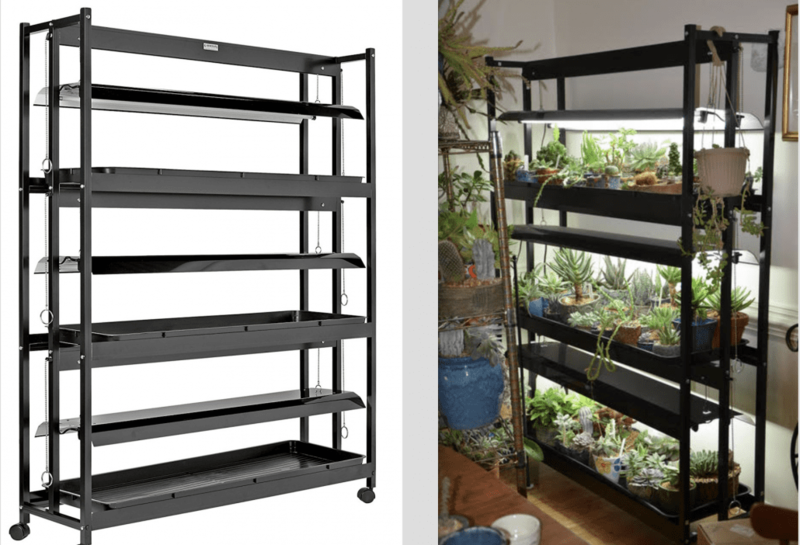 Three shelves provide 18 square feet of growing space. From Gardener’s Supply Co.; about $600. Get a timer which automatically turns the lights on at, say, 7 a.m. and off eight hours later. I like this one, below, because it has multiple outlets: Titan Apollo 14, about $26. Watch the temperature. If it falls below freezing (32 degrees F) many succulents may show long-term damage (or die). This indoor thermometer is digital and also has a humidity gauge. But what I love about it is that it keeps daily high and low temps for 24 hours! AcuRite 00613 Humidity Monitor with Indoor Thermometer, Digital Hygrometer and Humidity Gauge Indicator, about $12 on Amazon. Watch for pests. Succulents in cramped conditions are at risk of mealy bugs, spider mites and other pests. At the first sign of infestation, spray with 70% Isopropyl alcohol. Isolate infested plants so pests don’t spread, and clean the surrounding area. I can not have this tubelight arrangement for my succulents. Can I use a fluorescent light lamp for the same. I just have a couple of small pots. Expecting it would work in a same way. I live in Florida, and when I planted my succulents both in ground and in containers, I planted them on top of stones, mixed perlite with cactus soil, and just used about 3 handfuls of soil over the stones and planted. This worked out so well the rainy. Season is not a problem at all. After I finished planting, I added rocks between plants to cover the soil. It’s beautiful, let the rain come! So good to know! Thank you, Mary. Do you happen to know the varieties? That would be helpful, too!